Whether it's your jumping off point for longer trips through South Iceland or West Iceland or just a quick stopover on your way to Europe or the Americas, Reykjavik is the perfect city to get lost in for a day or two. In our Reykjavik travel guide below, we’ve got the best places to sleep, eat, & experience in the city. Use the table of contents to jump around. A small boutique hotel perfectly located on the main street in Reykjavík. Common areas in this hotel are limited, but the gorgeous restaurant Sumac (see Nosh) is on the first floor. Rooms are modern but cozy with super comfy beds, large showers, and a window sofa to curl up and people watch. Bonus: you have a Nespresso machine in your room and the pods are included. Wild Terrains tip: Ask for a room facing the back since the main street can be noisy at night. Prices start at around $280 a night. Click here to see more photos and read about our stay at Ion City Hotel. A posh hotel that doesn’t look like much from the outside, but is stunning on the inside. The lobby walls are covered in thought provoking contemporary art and an expansive restaurant/bar area with a fireplace is the perfect spot for a happy hour drink. Rooms are simply decorated in black and white with extreme attention put in the details. The basement has a beautiful private spa area with saunas and a heated plunge pool. Prices start at $360/night but you can use SPG points. Book here. If you’d like to mingle with other travelers and don’t mind sharing accommodations or bathrooms, we would stay at KEX hostel. Prices are the cheapest of the bunch, starting at around $50 per person per night. If you’re traveling with a group, there are a ton of great Airbnb options in Reykjavík. Considered the best restaurant in Iceland, Dill focuses on preparing dishes using local Icelandic ingredients. They only offer a tasting menu, but you can choose between 5 courses (around $105 per person) or 7 courses (around $125 per person). Wine pairings start at around $90 per person. The restaurant is super small, but adorable with concrete walls, a wooden slat ceiling, industrial hanging lights and an open kitchen. This was our favorite meal in Iceland and we think it’s totally worth the price tag. 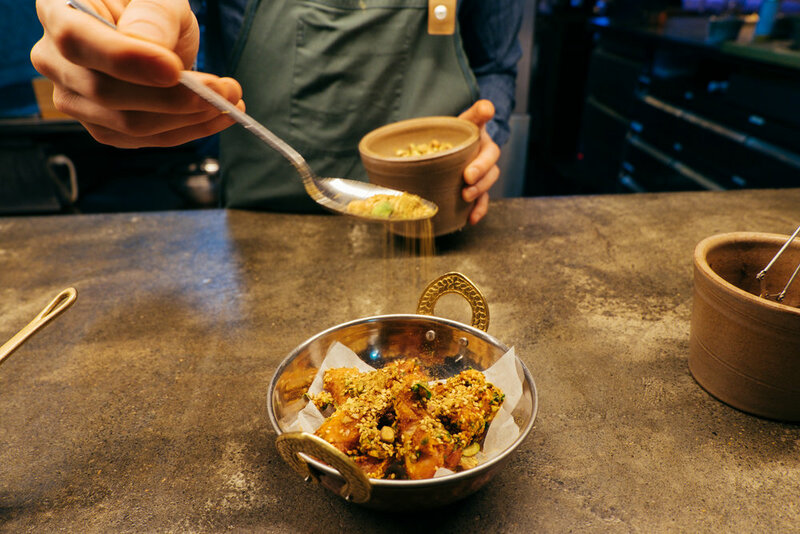 #WildTerrains tip: Given that it’s the most popular restaurant in Iceland, it’s tiny, and it’s only open four days a week for dinner (Wed-Sat at 6pm), you need to make your reservation weeks in advance. Do it the moment you book your flight. A beautifully designed Lebanese & Moroccan inspired restaurant found on the ground floor of Ion City Hotel (see Sleep). Sumac's head chef was recently named best chef in Iceland and he’s gathered a superb team at Sumac. We loved the cocktails, harissa chicken wings and the roasted cauliflower. Click here to see more photos and learn more about the dishes they’re serving at Sumac. This restaurant looks like it was picked up in Brooklyn and plopped down on the Reykjavík waterfront. We had one of our best meals in Iceland here. We split two entrees - the lamb and the beef cheeks - and we almost licked our plates clean. Matur og Drykkur also offers several tasting menus, one of which is called the Game menu and features a roasted pig’s head (yes, you get the entire head on your plate - vegans be warned). We didn’t have it, but we were wishing we had after we saw the dishes coming out to tables nearby. Make reservations ahead. Slippbarinn is a super trendy cocktail bar and restaurant located inside the Iceland Air Marina hotel. It’s a great spot for couples or groups. There are tons of little areas and nooks to hang out in, and you could honestly spend the whole night here. We sipped on a bartender’s choice scotch cocktail and noshed on freshly baked sourdough bread and the fresh catch of the day. Everything was really tasty and the vibe was exactly what we wanted after a long day of exploring. A super cute restaurant located on the marina. We came here for brunch, but they’re open for lunch and dinner, too. The Coocoo’s Nest passed our number one test: it was packed with locals. We also found that the prices were pretty reasonable compared to everywhere else. Great spot for a quick, unpretentious, yummy meal. Opens at 11am, not open on Mondays. Located a little ways from the central part of Reykjavík, Kaffihus Vesturbaejar is an adorable café that’s filled with locals throughout the day. Come for a casual coffee, breakfast, lunch or dinner. We had their lobster soup and a few pastries and they were divine. They also had free Wi-Fi, making it a great place to get some work done while we were on the road. A new bakery that makes crazy delicious cinnamon rolls. You’ll smell them a block away. A weird but magical place. Pablo Discobar is cooler than it sounds - an eclectic cocktail bar on the top floor of a little house with fabulous wallpaper, painted wood floors, intimate nooks and of course disco balls hanging from the ceiling. Other drinking best bets: Vedur, Slippbarrin, Loftið, KEX hostel, Skuli, and Stofan Cafe. You can get your hipster coffee fix at Reykjavík Roasters, a really cute corner coffee shop that serves the best brew in town. We loved the macchiato and the Greek yogurt with granola and honey. A modern, sleek bakery found on the main drag in Reykjavík – great for sitting down or taking a bite to go. Hrím is an Icelandic home design concept store filled with great gifts to take home for family and friends. Invest in some super stylish jewelry or pick out some quirky home décor. Another gorgeous home décor store filled with Nordic brands that are hard to find in the States. We walked away with a stunning patterned runner and lux velvet pillows by Nordic brand Home Doctor. It's a short drive outside the main area of Reykjavik. Fancy perfumes for fancy people in a gorgeous little shop. Very hard to miss. Hallgrímskirkja is an iconic modern church in the center of Reykjavík. If the weather is nice, buy a ticket (around $10) to take the lift to the top and you’ll have a stunning bird’s-eye view of the colorful, toy-like Reykjavík rooftops. If you're interested in architecture, this is your jam. The building consists of various geometric metal and glass structures that make it super fun to explore from the inside.